The September BAS meeting features the University of Lowell Sound Recording Technology's main recording and critical listening room. The meeting will start with a tour of the recording facilities, by Alex Case and Bill Carman, [both on the faculty of the SRT] and culminate in a presentation of the sound characteristics of room 114. Bring your favorite CD's. Designed by Bob Alach (Alactronics), the multipurpose recording/critical listening/surround mix space at UMass Lowell features a main room, an iso booth and a small guitar closet. The room includes 48 mic lines, a Furman 6-channel cue system and variable acoustics via sliding wall panels. The facility's aligned mains include SLS S1266 three-way monitors, Bag End D18E-I Dual 18-inch ELF subwoofer systems and a Bag End ELF-1 8Hz 2-channel low-frequency integrator. Mixing and mastering is accomplished via mobile production system using Yamaha DM2000, Steinberg Nuendo 32 I/O DAW, Genex GX9000 HD recorder and Merging Technologies Pyramix 8-channel DSD workstation. 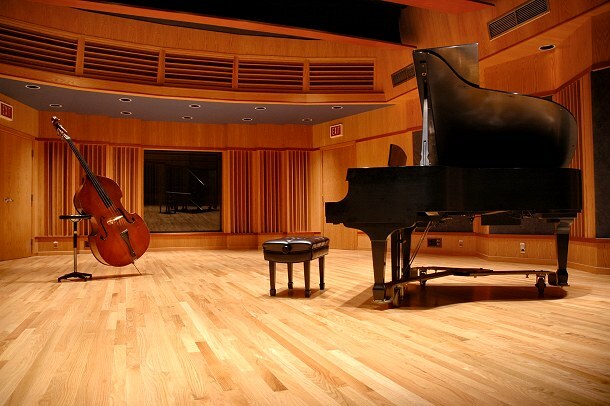 The Sound Recording Technology program at the University of Massachusetts Lowell required design of a space that could serve three functions: a critical listening classroom for 30 students, a live room for the department's premier 24+ track recording studio, and a 5.1 surround sound mix room. Accomplishing all of the above required a re-evaluation of room shape and treatments and aggressive use of variable acoustics. In addition, all the usual culprits of HVAC noise and vibration, limited space, a constrained budget, and a difficult to renovate reinforced concrete building added to the challenge. Take I-93 north from Boston and exit onto I-495 West. At the Rte 3 interchange look for the Lowell connector. Follow it and take the Industrial Avenue exit. Go right at the stop sign at the end of the off ramp and proceed to the rotary. Take the first right off of the rotary onto Industrial Avenue. The first traffic light is at the intersection with Chelmsford Street (Route 110). Proceed straight across. Industrial Avenue becomes Stevens Street at this intersection. Follow Stevens Street for approximately 1.8 miles and turn right just after the bright yellow house at the stop sign onto Middlesex St (may be no sign or sign for Chandler Square). (Stevens street continues for 1 more block and reaches a dead end). Go less than .5 miles and turn left at the 4-way stop onto Wilder (a convenience store is on the right). Proceed a short distance on Wilder to the traffic lights at the intersection with Broadway. University of Lowell's South Campus is ahead to the left. Continue on Wilder. Durgin Hall is the last building on your left before the end of the road at the intersection with Pawtucket. Park behind Durgin, or, if it is full, there are larger lots at the corners of either Broadway and Pawtucket or Broadway and Wilder. We can park in Faculty parking on Sundays. The meeting is in room 114.